Welcome to Tasmania! On arrival at Hobart airport, you will be transferred to your hotel. After check-in (approx. 2pm), the rest of the day is at leisure for you to explore Australia’s most southern city. This evening, meet your Evergreen Tour Director. Discover More: Bruny Island Adventure, Tour of MONA, Historic Hobart Walking Tour, Peppermint Bay Cruise or Cascade Brewery Tour (must be pre-booked, own expense). All tours are subject to availability and seasonal operation. This morning, travel through the Derwent River Valley and visit Bonorong Wildlife Park to get up close and personal with a Tasmanian Devil and many other native animals. Visit Richmond, one of Australia’s most charming Georgian villages. You’re Invited: Enjoy a wine tasting and light lunch as part of your visit to Puddleduck winery. The family owned and operated vineyard produces wines from grapes grown at the single site vineyard. After lunch, travel along the Tasman Peninsula to the Port Arthur Historic Site, once the home of up to 12,500 convicts. Visit the Interpretation Gallery and play the Lottery of Life, a unique way to learn about convict life. Join your Local Guide for a walking tour amongst the buildings and ruins. Cruise around the harbour to see the Isle of the Dead. 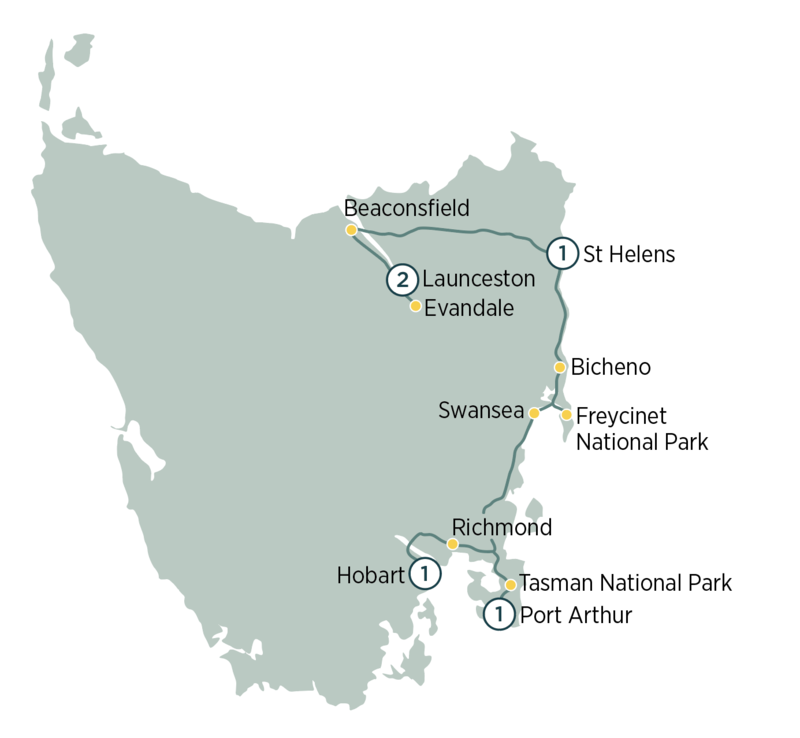 Stop at Tasman Arch and Devil’s Kitchen and continue travelling north through beautiful coastal towns. Visit the village of Swansea to see the convict built Spiky Bridge. Prepare yourself for the breathtaking beauty of Freycinet National Park. The dramatic peaks of the Hazards welcome you as you enter the park and enjoy spectacular scenery, azure bays and white sandy beaches. The Visitors Centre introduces the natural and cultural heritage of this region through creative displays. A Ranger Guide joins you for a short walk at Cape Tourville along the boardwalk track around the cliff line to the lighthouse. Enjoy the beautiful coastal drive to St Helens. Leaving the coast, traverse the scenic Weldborough Pass and drive through the lush Myrtle rainforest. Experience the colour of Bridestowe Lavender Farm, the largest and oldest lavender plantation in the southern hemisphere (Note: lavender is in bloom December and January only). Visit Beaconsfield, a town full of history and interesting old buildings. Here you’ll visit the Mine & Heritage Centre, a museum showcasing the history and heritage of the local area. Then, your included tour of Platypus World will give you a chance to see platypus up close. Your journey starts this morning with a visit to historic Woolmers Estate, regarded as Australia’s most significant colonial property. Join the Local Guide for a tour of the main house and spend time exploring the National Rose Garden which covers 1.5 hectares and is planted with over 3,000 roses. Next, visit the Tasmanian Gourmet Sauce Company and sample their delicious range of locally made sauces, jams and conserves. Return to Launceston and visit the famous Cataract Gorge Reserve. Explore its wonderful scenery through the network of walking trails. Discover More: Tamar River Cruise or James Boag Brewery Tour (must be pre-booked, own expense). All tours are subject to availability and seasonal operation. Your tour concludes this morning after breakfast with a transfer to Launceston airport.